Variance-based sensitivity analysis approach has been proposed for studying of input parameters’ error contribution into the output results of a large-scale air pollution model, the Danish Eulerian Model, in its unified software implementation, called UNI-DEM. 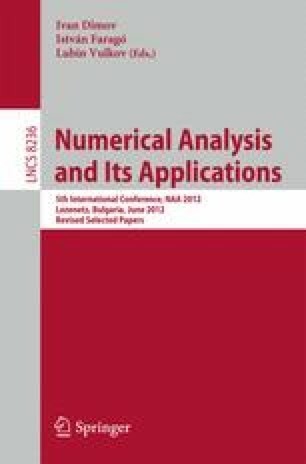 A three-stage sensitivity analysis algorithm, based on analysis of variances technique (ANOVA) for calculating Sobol global sensitivity indices and computationally efficient Monte Carlo integration techniques, has recently been developed and successfully used for sensitivity analysis study of UNI-DEM with respect to several chemical reaction rate coefficients. As a first stage it is necessary to carry out a set of computationally expensive numerical experiments and to extract the necessary multidimensional sets of sensitivity analysis data. A specially adapted for that purpose version of the model, called SA-DEM, was created, implemented and run on an IBM Blue Gene/P supercomputer, the most powerful parallel machine in Bulgaria. Its capabilities have been extended to be able to perturb the 4 different input data sets with anthropogenic emissions by regularly modified perturbation coefficients. This is a complicated and challenging computational problem even for such a powerful supercomputer like IBM BlueGene/P. Its efficient numerical solution required optimization of the parallelization strategy and improvements in the memory management. Performance results of some numerical experiments on the IBM BlueGene/P machine will be presented and analyzed.